This size, the 44, is the most popular. I can see why. Displacement ( at DWL) 43,140 lb. Ballast (Encapsulated Lead) 2,500 lb. NOTE: Calculated with a 10% fuel reserve. 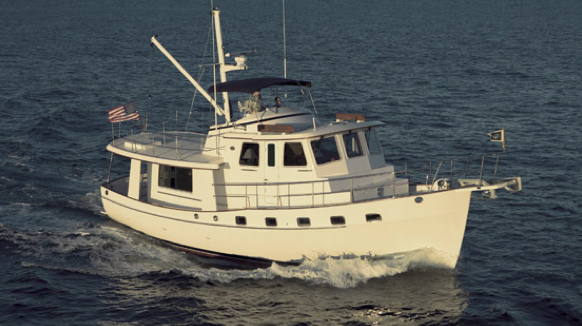 Kadey Krogen Yachts was founded in 1977 by naval architect Jim Krogen and yacht broker Art Kadey. The trawlers are full displacement boats, economical, capable to cross oceans. The boats are built in Kaohsiung, Taiwan. Boats are built to order from Krogen 44 to Krogen 58. The Krogen 39 is no longer produced. On my page “The One” I have a photograph of the Kadey Krogen 44AE. A girl can but dream. Large central queen bed in the stateroom. The engine room is a walk in. Sun shade aft to fish or sit and read a book. Two seats on the flybridge. You don’t see any late Kadey Krogen trawlers for sale. There are currently no secondhand Kadey Krogen 44 or 44AE for sale. There is a reason for that, the owners like them so much they don’t want to sell them. People retire to live aboard the boat. It’s a big decision. To sell the house and all your worldly goods and exchange that all for an adventure of a lifetime? Most never look back, they’re having too good a time away in their new home. This entry was posted in Boats and tagged 44AE, boats, Kadey Krogen, Kadey Krogen 44AE, Trawlers. Bookmark the permalink.